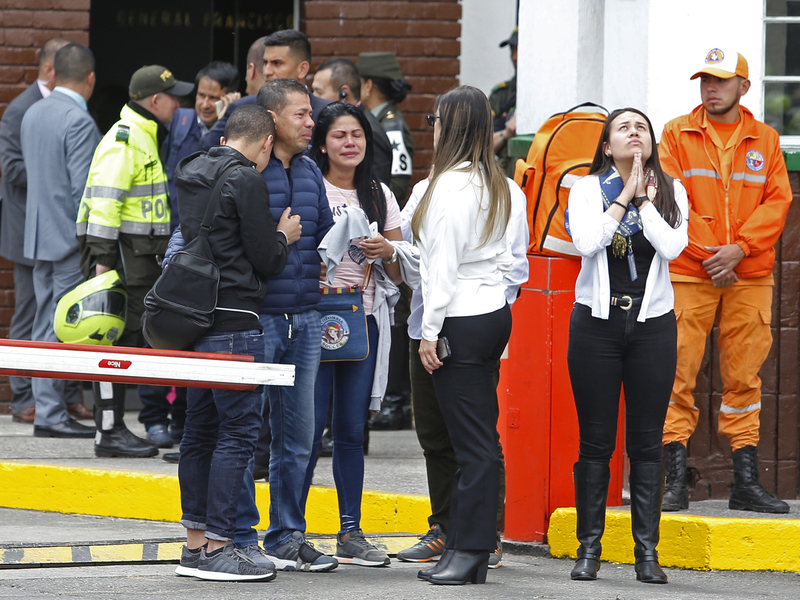 Deadly Blast At Bogotá Police Academy Stokes Fears Of Return To Colombia's Dark Past The attack, which killed 21 people and left dozens wounded, has been blamed on a leftist rebel group, the National Liberation Army. Forensic workers gather at the scene of a deadly car bombing at a police academy in Bogotá, Colombia, on Thursday. Chaos pierced the calm Thursday when a man drove up to the gates of the Escuela General Santander around 9:30 a.m. local time, according to local news reports. He accelerated, crashing into a wall. Then the explosion went off. Videos on social media show stretcher-carrying officers hustling the wounded past a blackened shell of a vehicle. The windows of area buildings are blown out and debris lines the street. Those hurt and killed were "unarmed students," according to Bogotá Mayor Enrique Peñalosa. City officials appealed to the public to donate blood to victims of the explosion. After news of the attack emerged, President Iván Duque vowed to bring the perpetrators to justice. "This insane terrorist act will not go unpunished," Duque said. "We Colombians have never submitted to terrorism; we have always defeated it." The U.S. Embassy condemned the attack and affirmed its solidarity with the people and police of Colombia. The mayor sought to calm fears, saying city residents "can rest easy. ... There is no indication of another terrorist attack." Thursday's explosion ended a tenuous feeling of peace in the city in recent years. Family members of bombing victims gather outside the entrance to the General Santander police academy. "This brings back terrible memories of passing by cars left alone and wondering if there was a car bomb," Arlene B. Tickner, a political scientist at the city's Del Rosario University, told The New York Times. "Over recent decades, there were many bombings in Colombia because of the conflict between the government and leftist guerrilla groups and drug cartels," reports NPR's Philip Reeves. "These tapered off after the largest rebel group FARC signed a peace agreement in 2016. But peace negotiations are stalled with ... the National Liberation Army. Colombia will likely lay blame on neighboring Venezuela, which it accuses of harboring ELN guerrillas." 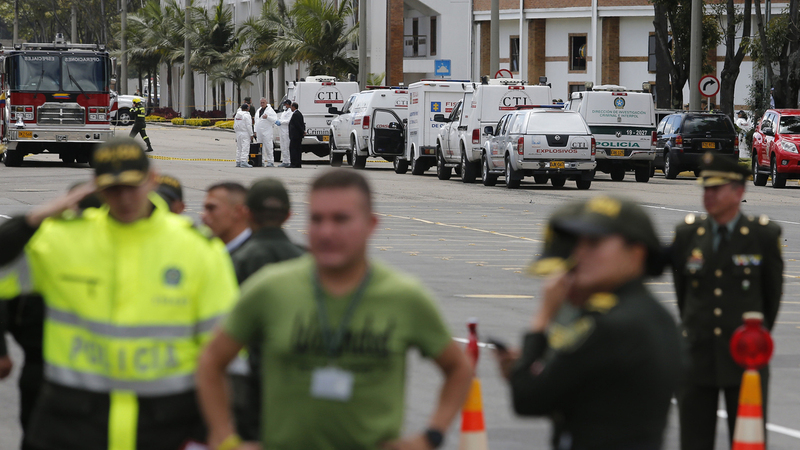 Last year, the National Liberation Army killed five police officers and wounded more than 40 others after bombing a police station in the northern city of Barranquilla. That attack served to derail peace talks between then-President Juan Manuel Santos and the leftist group. Duque, who took office in August, has rejected resuming peace talks with the group.